As Oklahoma recovers from severe damage caused by last week’s tornado, a majority of Americans (59%) say federal spending in response to natural disasters is emergency aid that does not need to be offset by cuts to other programs, while 29% say such spending must be offset by cuts to other programs. While there are partisan differences in opinions about how disaster aid should be treated, majorities of Democrats (69%), independents (57%) and Republicans (52%) say that federal spending in response to natural disasters does not require offsetting spending cuts elsewhere. The national survey by the Pew Research Center and the Washington Post, conducted May 23-26 among 1,005 adults, finds broad support across demographic groups for the view that federal spending in response to natural disasters is emergency aid and does not need to be offset by cuts to other programs. Comparable majorities of those living in the Northeast (62%), Midwest (58%), West (58%) and South (57%) all agree that federal spending in response to disasters is emergency aid. 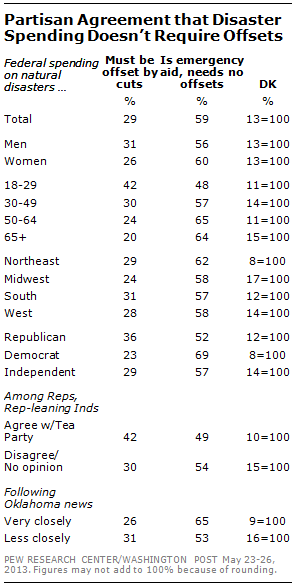 Among Republicans and Republican-leaning independents, those who agree with the Tea Party are divided: 49% say government disaster spending does not require offsetting cuts, 42% say that it does. By a 54%-30% margin, Republicans who do not agree with the Tea Party, or have no opinion of the movement, say emergency disaster spending does not require offsetting cuts. Young people under the age of 30 are about as likely to say emergency disaster spending requires offsetting cuts (42%) as not (48%). Broad majorities of all other age groups say federal spending in response to natural disasters is emergency aid that does not require cuts to other programs. Nearly half of Americans (47%) say they paid very close attention to news about the deadly tornado that stuck Moore, Oklahoma, last week. 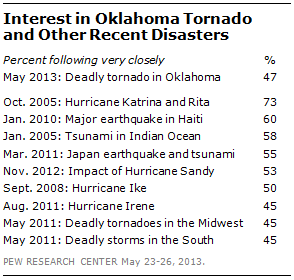 Interest in the tornado was only slightly lower than interest in Hurricane Sandy last fall (53%). Interest in the storm far surpassed interest in the week’s other top stories, including the murder of a British soldier in London (18% very closely), the debate over immigration policy in the U.S. (17%) and news about the Obama administration’s policy on the use of military drones (17%).